I've long been a Brubeck fan, albeit not a hero-worshipper oblivious to his sometimes heavy-handed approach, but one who appreciated his sincerity, his compositional qualities and (most of the time) his piano playing. Brubeck's innovative use of unusual time signatures brought a new dimension to modern jazz that only now is being brought into the jazz mainstream. Given this background, it isn't surprising that his family are continuing to keep his legacy alive whilst contributing some of their own. Apart from Chris and Dan, featured here, there is also pianist Darius Brubeck and cellist Matthew. Seven of the eleven tracks are compositions by Brubeck père although probably, only the opening Blue Rondo à la Turk will be familiar to the nonaficionado. Far More Blue; Easy as You Go; Since Love Had its Way; Tritonis; The Golden Horn and Thank You may be lesser known but are no less appealing and, in many ways, because they are less gimmicky, of greater lasting value. Easy has some mellow trombone from Chris who really blows 'dirty' on Lamb's Prime Directive. Thank You was inspired by Dave Brubeck's visit to Chopin's house in Poland. Anyone who watched last night's screening of the documentary, The Jazz Ambassadors, on BBC4 will recall that after Dave had played it at a concert, the Polish audience were stunned into silence for a full minute before erupting with rapturous applause. Lamb, on the 60th anniversary of that tour by the boy's dad, does that memory proud and Chopin too would surely have appreciated (I hope) the trombone playing over a bossa nova rhythm in 5/4! 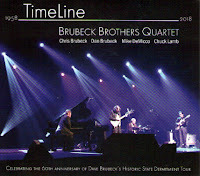 Chris Brubeck, Lamb (2) and DeMicco provide the other four compositions. Each one in keeping with the tradition. I heard Dan and Chris (and Darius) at Sage Gateshead a few years back with Dave O'Higgins taking the Paul Desmond role (on tenor) and I was a little hesitant when I noted there was no sax player on this album. My worries were unfounded, DeMicco's guitar solos and Chris' rich toned trombone provide the lyricism that Desmond did back in the day. Available on Blue Forest Records.